As long-standing followers of the ‘see food, will eat’ diet, we make it a point to hunt for all things divine. So, when we decided to visit a quaint café in Bandra that believes in addressing the said demand, we had to step in. And chomp. 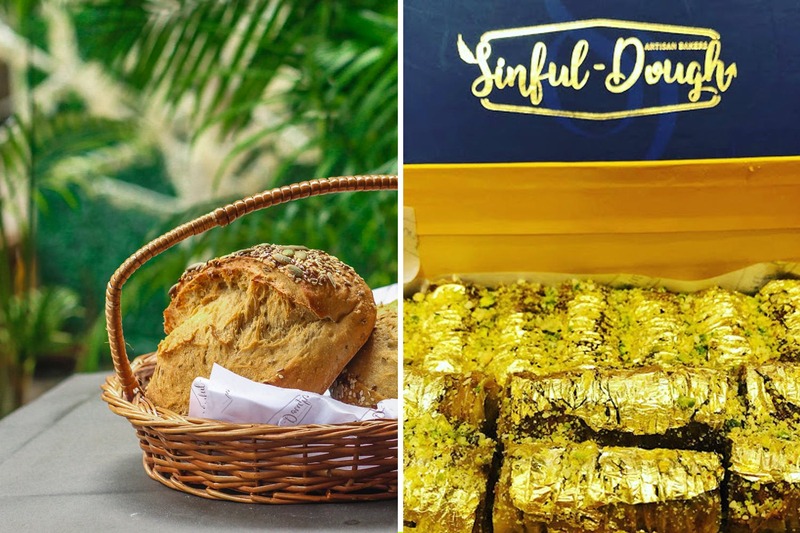 Sinful Dough, started by two friends Tahaves Shaikh and Devraj Kalani, is meant for all of us who believe in quality food that leaves a lasting impression. They baker artisan bread from around the world, and import their flour from Switzerland, France and Germany. Clean, bright and welcoming, the little bakery gives you the feeling of stepping into your home kitchen, except that it has fancy equipment to make fancier things we love to eat. The staff is more than welcoming, taking us through each plated specimen like a parent who lovingly talks about their favourite pet. Okay, we’ll be honest – right from the time we came to know about this place, we were wanting to try their baklava. We later realised that our enthusiasm reflected in most of Bandras’ hearts as it was one of their most popular items. Nevertheless, we did get to sample some and were so glad we did. They have four varieties – pistachio, hazelnut, coconut and cashew, and boy, did they blow our mind. They also have two special flavours – silver and rose & 23-carat gold baklava that’s made-to-order. Apart from this, their artisan bread includes varieties like black olive focaccia, chocolate challa, brioche, sourdough & so much more. They also focus on other sinful delights like cinnamon rolls, sticky buns, gluten and dairy-free bread, croissants, cookies, tarts, waffles, flavoured butters, sandwiches, hummus, milkshakes and hot beverages. We tried some of their banana bread, sticky cinnamon roll with glazed honey and walnuts, their oh-so-special chocolate brownie (it melts in your mouth) and even their hazelnut and chocolate cookie that left us wanting more. In a time when new bakeries and eateries are a dime a dozen, this is one sweet addition to Bandra’s dessert scene, that focuses on the new and an adaptation of the old. We recommend you pay it a visit and see it for yourselves.